Inspite of all the negative thoughts some Filipino's have towards the unbeaten American Champion Floyd Mayweather, who would have thought that there are also some Filipino's who believe in him. Like this two Filipino's who are part of The Money Team, Marikit or Kitchie as she is called who is an organizer of Mayweather's The Money Team and James Dayap, Mayweather's videographer. It was an unexpected opportunity to Kitchie when she met Maywaether by chance. She said in a statement, "We were putting gas and he was with a bunch of friends, and I knew one of the friends that was in the car," and added, "We were keeping in touch, and the next thing you know, I was around him. He was like, 'would you like to work for me as an assistant?' I thought he was joking, pero I took the chance." 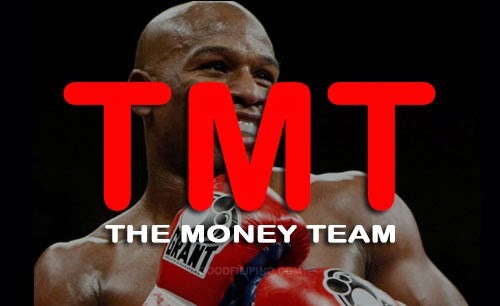 She then became Mayweather's personal assistant, she helps putting up things for the boxer, in or even out of the ring. As per Dayap, who also worked for Pacquiao before he entered Mayweather's team, had been the latter's videographer for some years now. Dayap said, "I am Floyd's videographer, and I shoot and edit videos for him all the time," and added, I shoot everything that he's okay with me shooting, and I travel with him everywhere when we go on vacations." To Dayap, Maywaether is far from what other people think of him. He said, "He's so misunderstood," adding, The Floyd Mayweather that I know, if you know Floyd, truly know him, you'll love him. He's a good guy, like his heart is pure. When he gives, he thinks about your family." He also quoted saying, "He's a warm-hearted guy. When we see someone homeless or helpless on the street, he'll pull out a couple hundred dollars, not just a couple dollars. He tips very well when we go out to eat. He got me a house – me and Alex Ariza. He got me a car." This two proud members of Mayweather team are among the first who announced the upcoming fight of the millenium thru their instagram accounts. For Kitchie, "To be a part of it is to be a part of history," - which she refers to the fight. "It's one of the biggest fights in the history of boxing. To be able to put that on social media was one of the most exciting things." Comments or suggestions about "Team Mayweather have 2 Proud Pinoy Members" is important to us, you may share it by using the comment box below.